coral reefs are already lost or severely damaged. And the decline continues with alarming speed. Get more coral reef destruction facts below and see how fast it is actually going. About one-fifth of the world's coral reefs have already been lost or severely damaged. Another 35 percent could be lost within 10-40 years. It’s happening at twice the pace of rainforest decline. Many threats to coral reefs are caused by humans. These threats include overfishing and destructive fishing practices such as the use of explosives and cyanide poison. The number of fish caught in coral reef fishing is already 64 percent higher than what can be sustained. Climate change is another important factor for the future of coral reefs. Coral reefs are very sensitive to even small changes in temperature and could therefore collapse. Support coral-friendly businesses when you buy for seafood. We know it's difficult to tell good from bad but we are working on making it easier. Estimates assembled through the expert opinions of 372 coral reef scientists and managers from 96 countries are that the world has effectively lost 19 percent of the original area of coral reefs; 15 percent are seriously threatened with loss within the next 10–20 years; and 20 percent are under threat of loss in 20–40 years. The latter two estimates have been made under a ‘business as usual’ scenario that does not consider the looming threats posed by global climate change or that effective future management may conserve more coral reefs. However, 46 percent of the world’s reefs are regarded as being relatively healthy and not under any immediate threats of destruction, except for the ‘currently unpredictable’ global climate threat. 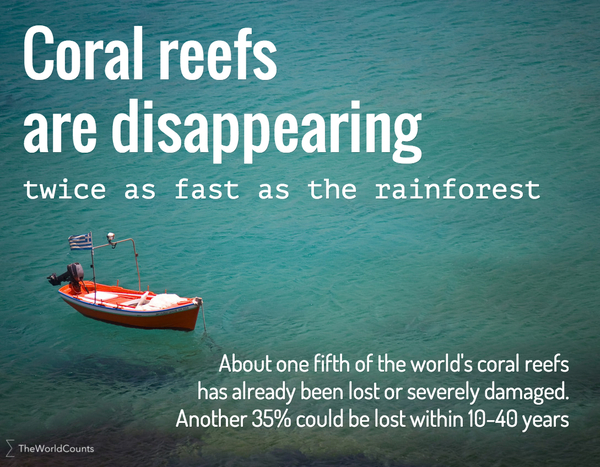 Interested in more facts like the coral reefs left? Then plug in and subscribe to our newsletter.